What is a “proper profile” and why will it improve your diving? Do you want to look like a sleek diving ninja? Then you need to learn how to achieve a good horizontal body position in the water. Usually, unless you have undergone technical scuba training, you may have a few issues with your profile and hence feel the need to kick every so often to adjust yourself, sometimes without even realising. A good profile requires dedicated practice and the application of basic principles and techniques that are fundamental in diving. Trim is about streamlining all of your equipment so that it doesnt dangle off you and in Sidemount your tins are in line with your body. Profile is a perfectly horizontal body position, as if the diver is laying on his stomach on an invisible platform. The diver’s legs are bent at the knees at roughlt 45 degrees, so that his fins are higher than any other part of his legs and the fins themselves horizontal. The diver’s arms extend in front of his body and his hands are at the same level as the top of your mask, or only slightly below it. No other part of the diver’s body or equipment extends below his horizontal body line. Why should all divers want a good profile? A good profile streamlines a diver to minimize drag through the water. Because streamlining reduces the effort required to move through the water, it lowers a diver’s air consumption rate and lengthens their dives. A diver in good profile keeps their fins slightly elevated, which avoids stirring up sand, silt and other bottom sediments. Elevating the fins helps to prevent damage to coral and other delicate aquatic life from accidental fin kicks. However, the most important reason that divers should care about their profile is that it allows them to have better control of all aspects of their diving. Why is control important for every diver? Every diver should work towards total automatic control of their position and movements in the water. 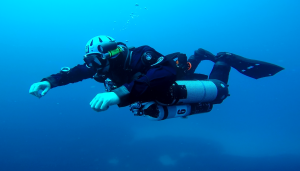 A diver with poor control must divide their attention between the struggle to remain stable and other important tasks such as buddy awareness, depth and time monitoring, as well as gas management. Any distraction from these life-sustaining tasks can be dangerous. Such a diver will be unable to focus on the more pleasant aspects of diving. They will fail to master complicated tasks such as photography, compass navigation and DSMB deployment, because they lose control of their buoyancy and position every time they shift their attention to another activity. How does a good profile improve a diver’s control? A good profile is part of the holy trinity of good diving: buoyancy, profile, and propulsion. Each is necessary for control. A diver’s profile effects their buoyancy, and therefore their ability to maintain a stable position in the water. How does a diver’s profile affect their buoyancy? A diver with a poor profile swims with their body at a diagonal angle through the water. A diver who points their body up will swim up, a diver who points their body down will swim down. 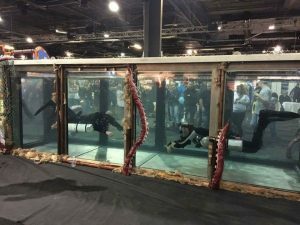 As they change depth by swimming up or down, the air in their buoyancy compensator (BCD) will expand or compress, causing them to lose neutral buoyancy. This is exaggerated even more when wearing a dry suit as the air will migrate to the highest point of the suit. Consider the example of a diver who swims slightly feet-down, which propels him slowly upwards. Because they feel that they are moving up, they dump air from the BCD. They can maintain a consistent depth by kicking upwards while negatively buoyant, but they are exerting extra energy and will sink the moment they stop kicking. A diver who swims feet-down may erroneously believe they are under-weighted because they tend to float up as they swim. If the diver adds weight, they shift their center of gravity towards their lower body. This forces them further out of profile and causes them to drift upwards even more rapidly. A diver who swims with their feet too high has the opposite problem. They generally add too much air to their BCD to compensate for the fact that they swim downwards. This increases their frontal profile and drag and causes them to float upwards whenever they stop swimming. Again when wearing a drysuit, the air migrates to the highest point, being their feet which exaggerates the issue. This unfortunately leads to an inverted ascent, which every diver wants to avoid. Therefore many divers are taught not to put any air in their feet and maybe use ankle weights to keep their feet down. A diver who swims with a poor profile will have poor control. They lose buoyancy every time they stop moving, and must continuously fight to maintain a uniform depth. They will never learn to correctly control their buoyancy using their lungs and BCD, because they swim themselves up or down to keep ‘neutrally buoyant’.